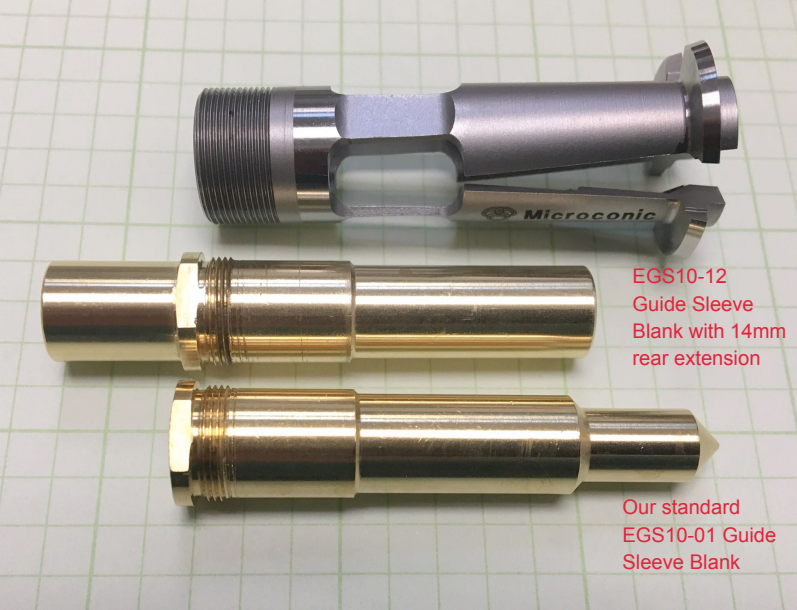 ​The standard Microguide EGS is made of brass. 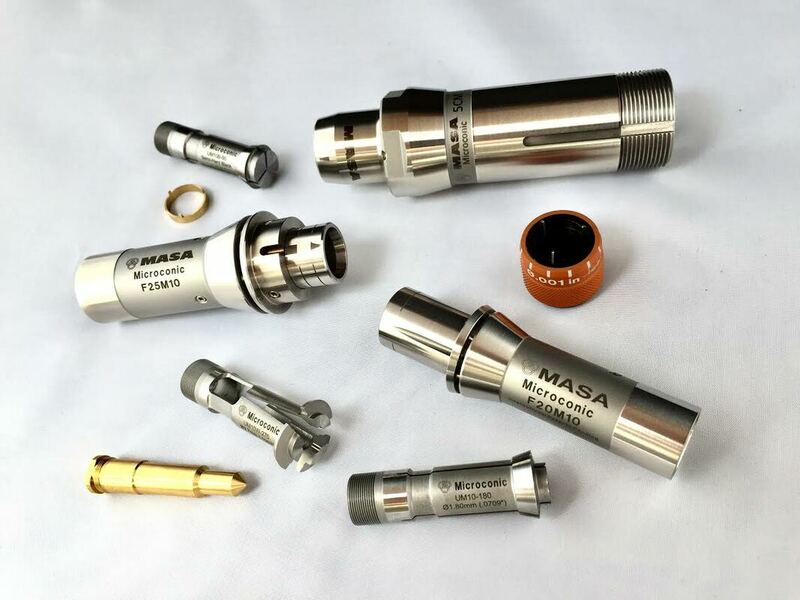 Masa Tool has expanded the standard offer of Microguide EGS to include a selection of both Plastic and Stainless Steel versions. A critical aspect to using over-grip collets is to make sure the part is ejected reliably when it is completed being machined. Due to the wide opening of the over-grip collets, parts can get jammed in the collet slot. As a result, the collet will be damaged or break when it is closed. 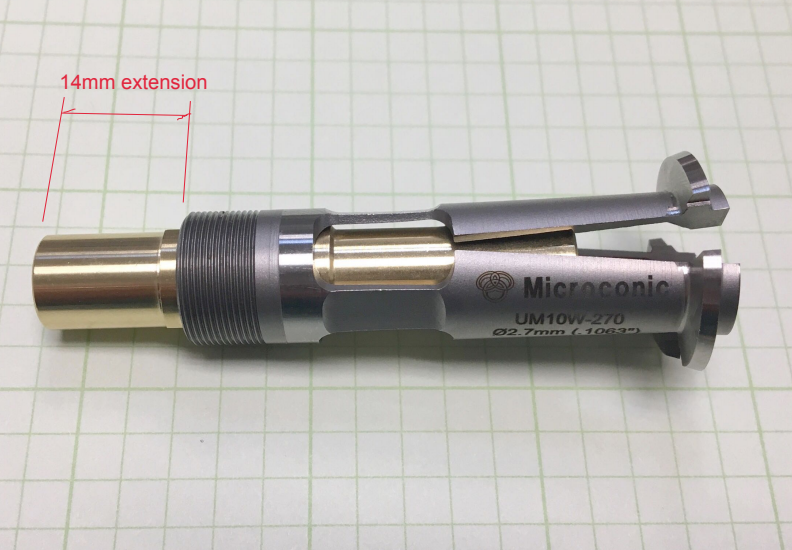 Every Microconic over-grip collet is supplied with a blank Microguide EGS ejection guide sleeve that you can drill to size to fit your specific part to enable the finished part to be ejected consistently without damage to the over-grip collet. The EGS is meant to be drilled through with a loose-fitting hole that will support and help guide the workpiece as it is ejected from the collet. Users can customize the Microguide EGS to match their specific workpiece and method of ejection. 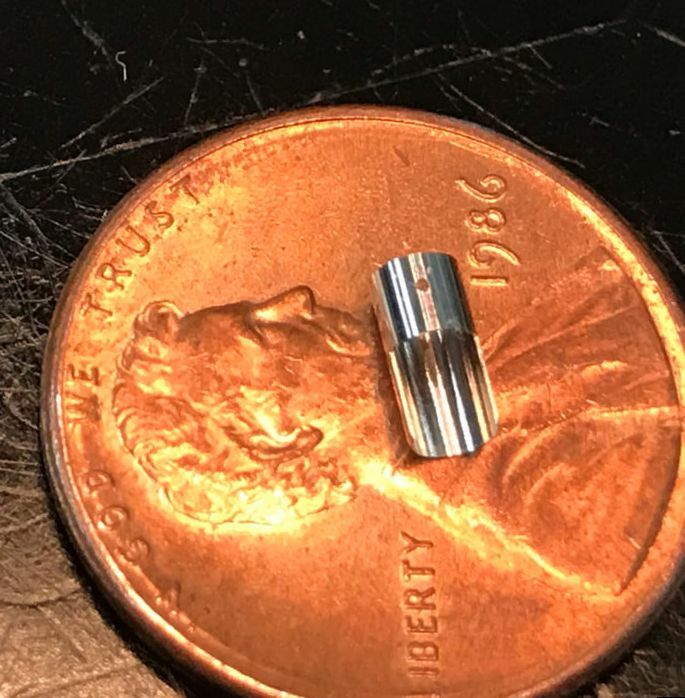 We also have a special type of guide sleeve blank designed for very long parts like this, which extends out the back end of the collet about 1/2" further to give some support. They are our part number EGS10-12. CEDAR GROVE, NJ. - Metal Cutting Corporation is an independent metal fabricating company that specializes in the burr-free abrasive cut-off of metal parts and the related grinding, lapping, polishing, turning and EDM. 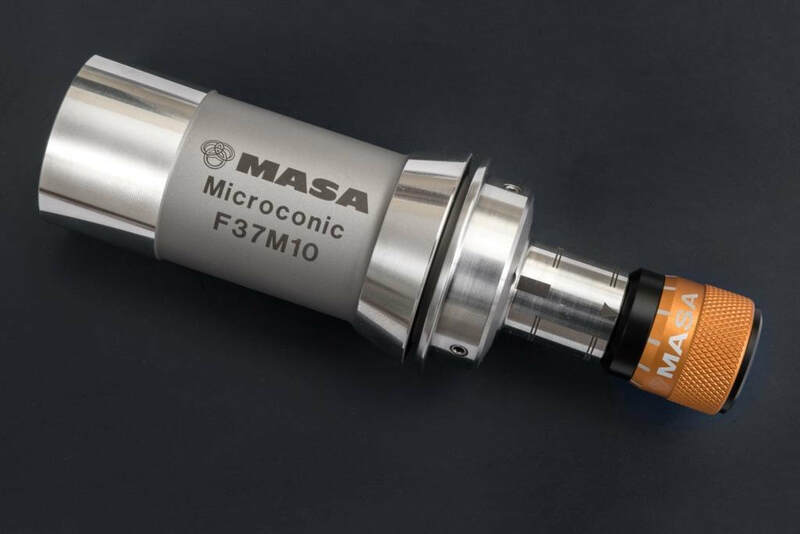 They manufacture precision metal components for a diverse range of industries, including medical device, automotive, electronic, biotechnology, semiconductor, aerospace, fiber optic, electrical and general mechanical industries. 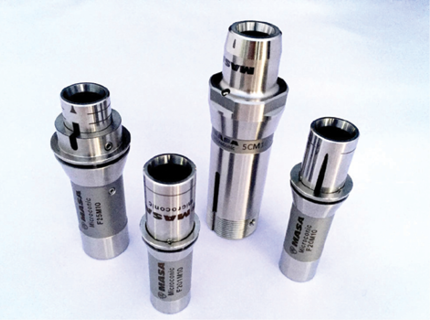 "I recently purchased your collet system and can't tell you how happy I am with it. I have a part the has a .004 wall thickness and before your collet, no matter what I did I kept getting collet marks on my parts. Not only are the collet marks gone but it's within .0002" round. Thank you for making a superb product." ​That comment lead to us wanting to learn more about how Metal Cutting was using our workholding! This is the very first application success story that has been shared with us on Instagram. Rich was kind enough to send us some information about how he came to be using Masa Tool. "The pictures with the part on the penny is the one I mentioned on Instagram. 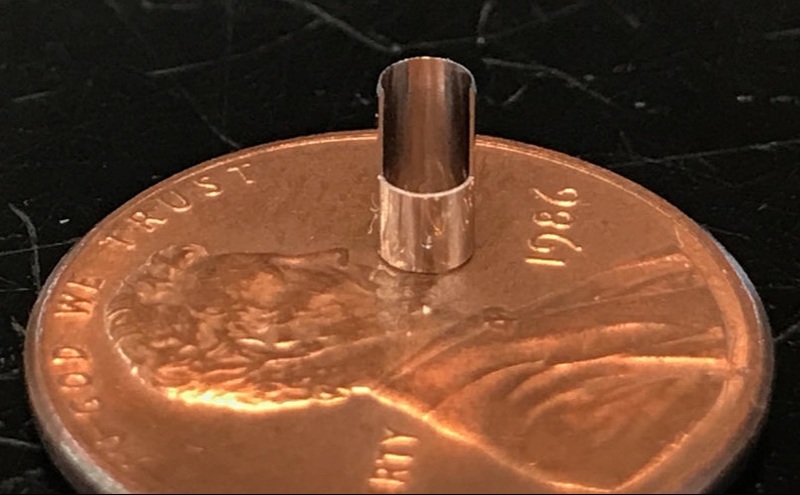 I have work on this part for the past 5 years and just when I was ready to throw in the towel I saw an adverstisment for your Microconic collet system in Production Machining Magazine. 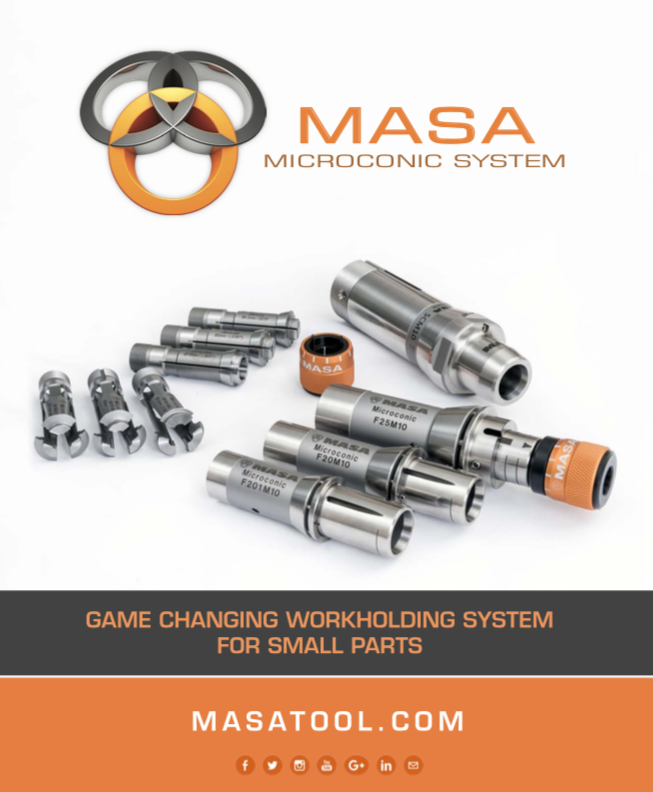 I got in touch with Doug Brown, the Vice President of Allendale Machinery here in North Jersey, and he put me in touch with Masa Tool's regional manager Mark Bergonzi." 316L made from solid rod. Check out the .013" hole. It's only out of round by .0001". Made on a Citizen K-16. Metal Cutting Corporation was founded in 1967 and moved to their current 52,000 square foot manufacturing facility in 1998. In 2008 they expanded their existing machine shop capabilities with Haas and subsequently Citizen turning equipment, allowing them to offer multi-axis CNC milling, lathe and automatic Swiss style machining up to 7 axes. Their specialty has always been small diameter parts made from all metals. "The parts can be long but are most often short, often very short." When the company started in the late 1960's they primarily worked with non-ferrous metals, especially tungsten and molybdenum. So much so that in 1984 they became the exclusive North American distributor for Nippon Tungsten Co., Ltd.’s tungsten and molybdenum products. Since the the 1980's they have been working with and machining more stainless steel and now have a developed a deep knowledge of machining the newer nickel and titanium based alloys. The part shown above has a .001" runout specification and previously run parts showed that the pickoff collet was making a tri-lobe detent on the .032" diameter. Needless to say Masa Microconic eliminated that problem. 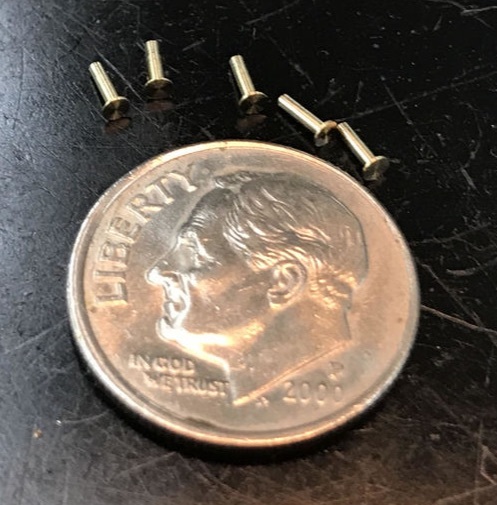 Tiny brass contacts made on Citizen K-16E VII and held with Microconic. The head thickness is .010"/.012" and the small diameter is .030"/.033". Mark, from Masa, and and Doug, from Allendale Machinery, visited Rich at Metal Cutting. According to Rich, "I was sold before he could get it out of his demo case." ​"Since this part is a medical part every thing had to be perfect. Ever since I purchased the Microconic system our customer has been very pleased with our parts and, believe it or not, it has less burrs than before." Over the past several months Rich has been able to apply the Microcnic system to several other products that they make in their Citizen Machines.